Akropol Cad. 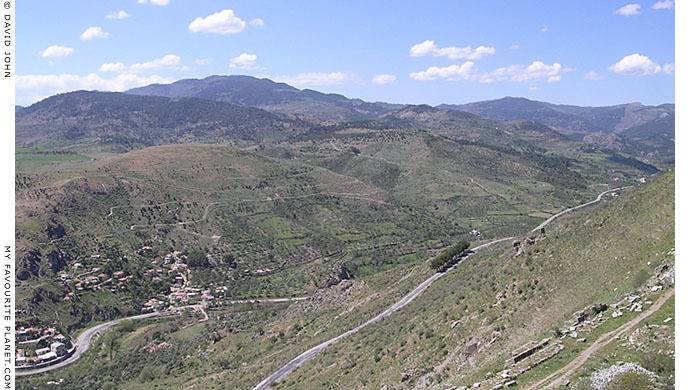 (also known as Kale Yolu), the road from Bergama up to the Acropolis (see below). 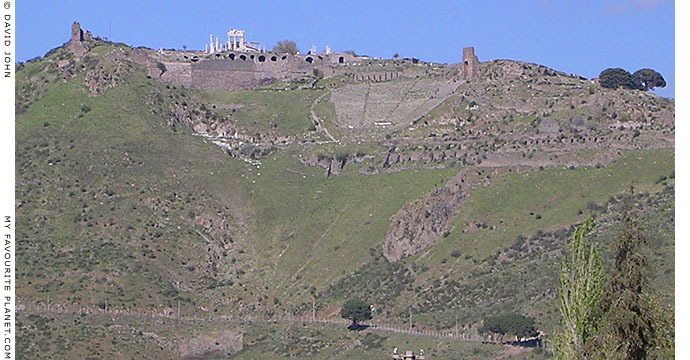 The steep west side of the hill of the Pergamon Acropolis. 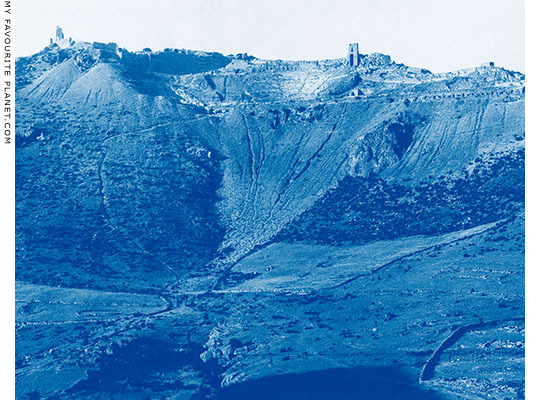 Photo of the Pergamon Acropolis taken 1880-1910 from the same perspective. Photographer unknown. Source: Library of Congress, Washington DC. with a dramatic location and wonderful views. Opening times: every day 8:30 - 17:30; May - September until 19:00.
as seen from the west side of the Pergamon Acropolis. The narrow road which crosses diagonally up from the bottom to the middle right of the photo is Akropol Caddesi (also known as Kale Yolu), the road from Bergama up to the Acropolis. It is a continuation of Bergama's main street Bankalar Cad, and starts at the north side of the river, just east of the Red Basilica. From there it snakes its way up the west flank of the Acropolis hill, loops around the north face and steeply up to the car park and entrance to the Acropolis archaeological site. Altogether, that's a haul of over 5km, and can be hard work by foot on a hot summer day. It's therefore not surprising that so many visitors take the "Telerifik" cable car or a taxi. For those who have the time and stamina to make the hike, it's a great walk, and the beautiful views make it well worth the effort.